Example: Video Unlimited Plan is Charged at $99 per month. This can be further billed in many different ways using the system. One Time Charge: This indicates that the Order is billed only on the 1st billing period. From the example, if One Time Charge is chosen, your customer will be billed for One Month only. Recurring Charge: This indicates that the Order is billed for each billing period. From the example, your customer will be billed every month automatically by the system. Asset Counts: This indicates that the Order will be billed based on the number of asset counts. From the example, if 2 was the number entered in the field then your customer can be billed $99 every 2 Days or 2 Weeks or 2 Months or 2 Quarters or 2 Years. 6. Auto Recharge: This indicates that the customer will be charges based on external usage activity with free units. For example, if your customer has some free videos that can be viewed, it can be mentioned in the Initial Units and chargeable units can be mentioned in Units per Billing Period. The Pricing Type indicates how a product can be priced. The pricing can depend based on the number of units, based on the tier..etc using the below configuration. Fixed: This indicates that the amount will remain the same regardless the quantity. For Eg if your customer is has a fixed price that does not vary on the quantity purchased, this pricing type can be used. 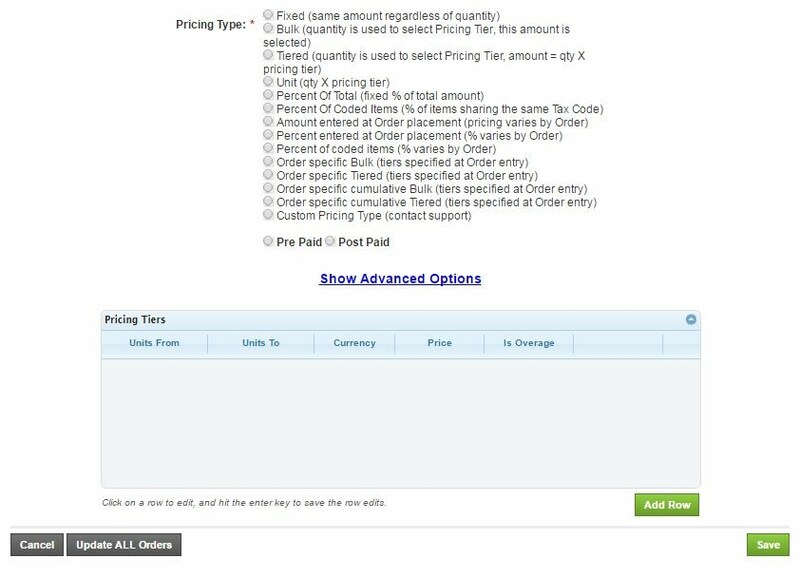 Bulk: This indicates that the quantity is used to select the pricing tier. For Eg, your customer can pricing their product depending on the different tiers mentioned in the pricing tier. If the quantity falls under one of the pricing tier then that amount will be considered for billing. Tiered: This indicates that the amount is the combination of Qty and Pricing tier. For Eg, your customer can create multiple tiers depending on the quantity and quantity will be multipled by the price. Unit: This indicates that the the price depends on the quantity mentioned. The quantity is multiplied by the price mentioned in the system. Percent of Total: This indiacates that the percent is fixed of the total amount of the charges in the plan. For Eg, If there are 3 charges in the plan, the system will calculate the total of all the 3 charges and calculate the percentage of all of them. This charge is best used for calculating taxes of a plan. The Tax charge has to be enabled under “Show Advanced Options” for this to work. Percent of Coded Items: This indicates that the items in the plan share different Tax Codes. For Eg, if your customer has 3 charges which needs to have taxes calculated individually, this options can be used. Amount Entered at Order Placement: This indicates that the price varies by Order. For Eg, if your customer has varying prices for every product or needs to enter the price the time of Order Placement then this can be chosen. Percent entered at Order placement: This indicates that the price varies based on the percent mentioned at the time of Order placement. For Eg, if your customer has varying percentages for every product or needs to enter the percent at the time of Order Placement then this can be chosen. Order specific Bulk: This indicates that the Bulk tiers can be mentioned at the time of Order placement. Order specific Tiered: This indicates that the tiers can be entered at the time of Order placement. Order specific cumulative Bulk: This indicated that the cumulative bulk tiers can be entered at the time of Order placement. Order specific cumulative Tiered: This indicates that the cumulative bulk tiers can be mentioned at the time of order placement.